It’s 2am, there’s something crawling around the roof space of my campervan and a dead cat outside the door. I wondered, not for the first time, if it was such a good idea to embark on this VW camper road trip adventure. 3,000 miles, 3 countries, 6 days and 4 nights. Just me and my campervan. This wasn’t inspired camping, this was ultimate camping! A year ago we started planning this holiday. It was time for another visit to the in-laws in Gibraltar but I’m terrified of flying and so I decided to drive down while the family flew. I planned a route through France and Spain, down the western side of Europe with a drive time of 20 hours. I booked my ticket for Eurotunnel and one night’s accommodation at a budget hotel. But three months prior to my departure, everything changed. Earlier this year we went camping with friends near Corfe Castle. We stayed in a bell tent while they came in their new black VW campervan. Once I saw “Rock Bus” I was instantly smitten with this angular Death Star of the road. 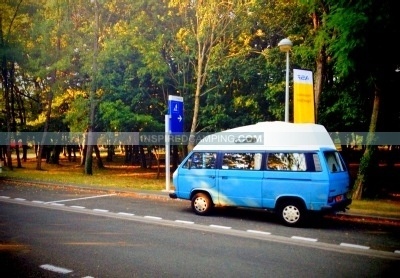 I could picture myself in my own van, driving round the world, like Ewan McGregor, meeting new people. The seed was planted and within three short weeks I had bought Gloria. Gloria is my VW T25 High-Top Campervan. She is blue and white and has a Spanish theme with señorita curtains, rosary beads in the window and a statue of Jesus on the dash. I decided I would wild camp all the way to Gibraltar and so cancelled my budget hotel and upgraded my train booking. What I did not do, and this would cause problems later in the trip, was review my chosen route to see if it was still suitable considering my revised mode of transportation. Blissfully unaware of this pending error in judgment I set off one early, foggy, summer morning for Folkestone. Before long I was in France and speeding through the picturesque countryside. Driving through France was a joy as the beautiful scenery blurred past my windows. There appeared to be so many opportunities to stop and visit but for this trip there was no time. Service areas were at regular intervals with good clean facilities and pretty shaded areas to rest. The weather was glorious as I headed towards Paris then onto Orleans, Tours, Poitiers and Niort before finally stopping for the night at an Aires south of Saintes. On my arrival I parked up, threw open Gloria’s sliding door and prepared my supper. As I sat in Gloria, sipping red wine and eating a baguette, I watched a gentle breeze drift through the adjacent sunflower field and I knew my love affair with continental camping had begun. The following morning I watched the sun rise over the field before wandering off to find a place to wash. I spent a few moments pondering the etiquette of showering outside before stripping down to my underpants and diving in. Soon I was off with Gloria pulling ahead like an eager puppy. The planned route through Spain was San Sebastian, Bilbao, Valladolid and finally stopping at Salamanca for the second night. But within minutes of being in Spain I experienced my first problem as I was suddenly plunged into the mountainous region. Gloria struggled with the steep climbs and I watched in despair as my average speed dropped below 40 mph. At this rate it would add another day to my journey. The drive was relentless and I was oblivious to the beauty around me as I obsessed about trying to make good time to my destination. But if I thought the mountains were bad, things were about to get a lot worse as I hit the plains of Spain. The climate was unbearably hot and the landscape was barren. I spent hours driving through vast areas of nothingness with no places of interest. The services were less frequent, poor quality, dirty, offered no respite from the heat and most were off the motorway in small shanty towns. The heat was so intense that I spent all the time looking at the engine temperature gauge. Two hours outside of Salamanca the needle on that gauge disappeared. I pulled over and checked the engine. Finding no obvious problem I carried on but spent the final hours crawling. By the time I arrived I was tired, dehydrated, emotional and doubting if I would ever make Gibraltar. Prior to departure there had been warnings on forums about the risks to lone travelers of muggings in Europe and so I made a late change to my plans and booked myself into a campsite. 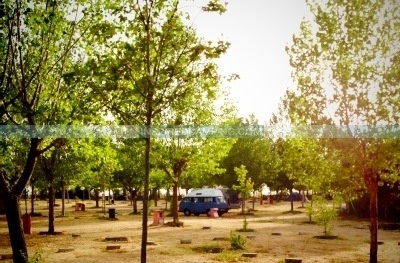 The Hotel Regio has a campsite at the rear with full facilities including supermarket, cafe and swimming pool. For a mere €17 I had electric hook-up, clean showers and toilets. I was hot and smelly so the first job was to cool off in the showers. On the way back I spotted another T25 with Spanish number plates. T25 owners are a friendly lot and always willing to help, so I wandered over for a chat. It turns out he didn’t speak a word of English and as I don’t speak Spanish I could tell communication was going to be a challenge. I started off with a smile and wide gestures with my hands towards his van. I then frowned and stabbed my fingers towards Gloria. I growled, held my head in my hands and pointed at the sun. As this strange dance routine developed a wonderful thing began to happen. We began to communicate. When I had finished he silently looked at me, turned to his wife, said something and headed off towards Gloria. He pointed to the driver seat. I nodded my consent, he got in and … began to rip apart the dashboard. Oh my god! What was he doing? Had I told him to do that? All I could do was watch but an hour later he had reassembled the dash, fixed the needle problem (it was a broken connection to the sensor), fixed other problems he found with the engine and finished by giving me lessons (all in Spanish) on the best way to drive in the heat. I couldn’t believe my luck. I hugged him, I thanked him, I brought him wine and then I collapsed in Gloria and slept. The next day, with renewed vigor, I set off on the final leg of my journey. Caceres to Seville then, Algeciras, through La Linea and into Gibraltar. The drive was much better as I utilised the new driving skills and whizzed along at 55 mph. The previous day’s temperature had been a record 45° but today was a far more manageable 35°. Music blared through Gloria’s open windows as we sped to Gibraltar. After a couple of hours I made my first fuel stop and was approached by a couple of English chaps in motorbike leathers. On a charity drive down to Africa using C90’s (small motorbikes) they were also having some mechanical problems. One guy had broken down and was in France awaiting parts from eBay while these guys were having a problem with a loose fuel pump. I offered them some cable ties to help stick the thing back on and wished them luck as I pushed on with my own adventure. By lunch I was near Seville and stopped at a rundown cafe for lunch. I order a Coke and a ham sandwich but was given coffee and toast by a burley barman. I timidly ate this alternative lunch and headed back to Gloria. I was again approached by a couple of English chaps. Adrian and his friend were on a surfing holiday around the coast in a campervan. Unfortunately Adrian wiped out on some rocks which resulted in the doctors pinning together his shoulder. This was the end of their adventure. By mid-afternoon I was past Seville and on the last leg of the journey. At my final fuel stop I met a group of American students on a tour of Spain in a beaten up old Ford. 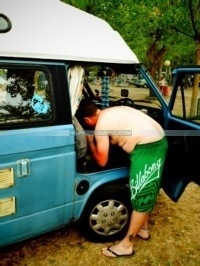 One of the guys excitedly explained how he also owned a VW campervan back in Texas. Now I was really enjoying myself as I was meeting people and playing bit parts in their adventures. That’s the thing when people see VW campervans. Everyone is willing to stop and chat. Gloria and I posed for photos before heading off. 60 hours after leaving the UK, I crossed the Spanish border and into Gibraltar. With the Union Jack flying above it was like coming home (albeit 1500 miles further south and a lot hotter). Hello Gibraltar! But I am only half done; there’s still the trip home and my encounter with that dead cat. So make sure you pop back here next week to hear the final part of my VW Camper road trip story with Gloria. My name is Colin Woodley and I am a husband, father of two, salary slave and late bloomer in the world of camping (having only started this year aged 42). I own a T25 VW campervan called Gloria and my new life goal is to get out of the rat race, move to Sussex, sell cider, write blogs, drive around in an old Range Rover and campout every weekend. Don’t forget to sign up for our free updates and bonuses if you want to be one of the first to hear about our future competitions. It’s free, you can unsubscribe at any time and it will give you access to our regular giveaways. Also, for daily updates and to see some of what goes on behind the scenes at Inspired Camping, click ‘Like’ on our Facebook page. Plus, for daily ramblings, inspirations and cool camping and glamping chat, follow Sarah on Twitter.